So much pressure put onto people to be with family and friends and when they are not, the feelings of sadness and loneliness weigh so heavy on some people’s souls, they never make it through the night or the holidays. Some people have no families or homes to go back to for a number of reasons. Parents have died, they have no living relatives, abusive homes were left long ago and wounds never healed, foster homes that were not really homes, not enough money for travel or gifts, illness, shame and a number of many more. Judgment of and disrespect for each other also fills many empty rooms and houses instead of people. Joseph and Mary experienced much of the same … misunderstood, judged, and ostracized too they ran for their lives and the life of the son Mary was to bear on Christmas Eve. Who were Joseph, Mary, and Jesus surrounded by on the night we celebrate as Christmas Eve and Christmas day? Strangers, of course … kind strangers. Family and friends all together for the holidays is all such a lovely idea, but one that leaves out so many other people in the world … including those who do not know where the idea of Christmas and the spirit of Christmas … love … came from. This Christmas take the pressure off family and friends and share some love with a stranger or two or three … especially with those who have so much less than you. Jesus would … and he would want you to do so … in his name … for that is the reason he came Christmas Eve over two thousand years ago. Merry Christmas all! May the spirit of Christmas fill your year with loving thoughts, words, and actions! And if the spirit of Christmas … love … is not what you believe in, then please consider at least valuing … respecting … each and every life … who is just as valuable as you … not more … but also not less … it’s a big step to making the world, including your own, a much better place for us all to live and thrive. The RESPECT SPECIALIST … Freeing “Potential” with Education, Entertainment, and Inspiration! CONNECT … with RESPECT! ORDER the powerful little book Connecting the Dots … with The RESPECT PRINCIPLE and PURCHASE the Performance Rights of CHARLES’ CHOICE … because every child … every person … should know, by their own experience, they are valued … RESPECTED. © All rights reserved 2014. Take care … love well … back soon! 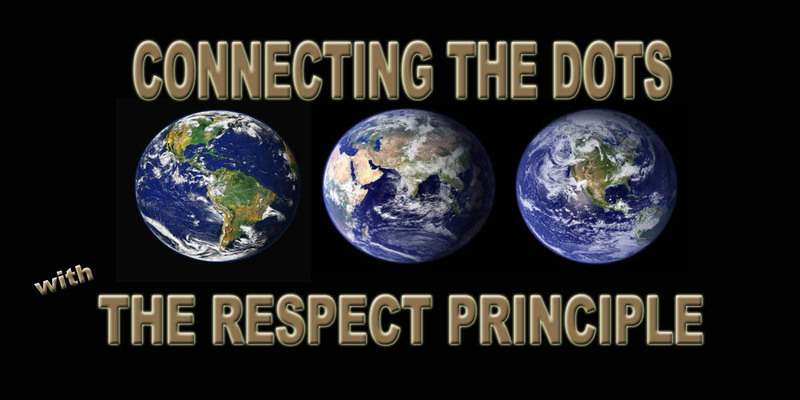 Connecting the Dots … with The RESPECT PRINCIPLE … because every child … every person … should know by their own experience … they are valued … RESPECTED. RESPECT transforms the quality of life. RESPECT is not something a child … teen … adult … senior … should have to earn. Want a better world? … be a more “respect-full” person. CONNECT … with RESPECT! ORDER Connecting the Dots … with The RESPECT PRINCIPLE … because every child … every person … should know, by their own experience, they are valued … RESPECTED. © All rights reserved 2014. Though in a different way, children in school, also put their lives into others hands, trusting them to keep them safe … but today’s events in Pakistan where over 140 were killed in a very low Respect Level act compels me to get back on track regardless of what else is going on … because we need more valuing … respecting … of all life in our world to stop such very low Respect Level thoughts and actions. … so, tomorrow, back to the blog and its reconstruction to further achieve that goal! And thank you for dropping by with your over 5000 views! What’s Hot this Christmas? … and Every Day of the Year? Getting ready to reveal soon! Till then … wishing the best for all, Christmas believers … and non-believers. Connect … with RESPECT by ordering your copy of Connecting the Dots … with The RESPECT PRINCIPLE NOW … because every child … every person … should know, by their own experience, they are valued … RESPECTED. © All rights reserved 2014.